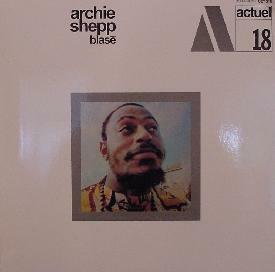 Continuing with it's fine string of BYG vinyl reissues comes one of the many LPs recorded by Archie Shepp during his stay in France during 1969. In this period he recorded on a variety of European labels, including quite a few on Claude DelCloo's BYG records. GET BACK Records has begun to re-issue some of these recordings in a very high quality format, with solid vinyl and full color sleeves, a great improvement over the 1978-1982 reissues of BYG material that appear on AFFINITY/CHARLEY Records! Unfortunately, this is a release they should've forgone, as it is an example of releasing music that should've been rehearsed more before it was recorded. Shepp's ideas here are solid with regard to the concepts he's dealing with, but the execution of those ideas leaves a lot to be desired. The major musical innovations here are the use of the Blues Harps of Julio Finn and Chicago Beau, the lighter-than-air vocals of (recently deceased) Jeanne Lee, and the drumming of former Miles Davis percussionist Philly Joe Jones, who was an innovator in the Bebop revolution that had occurred in jazz during the late 40s, and came to fruition in the 1950s. Despite the combining of players that represent different genres of African-American music, the actual playing is sloppy, and rhythmically unsteady. The Harps sort of drone on, oblivious to the key the compositions are written in, and fail to establish any rapport with the rhythm section; Shepp's solos take on a lackluster quality, as if he's actually bored or distracted. Even Trumpeter Bowie, whose blowing here is top notch, cannot inject any life into the dull readings of the tunes recorded here! Only Vocalist Lee (who has recorded extensively with German Vibraphonist/Reedsman Gunter Hampel),and Pianist Dave Burrell, actually come alive during the tracks. In view of the excellent Shepp Antibes' festival performance in '69, which was released by BYG as a 2-LP set, these recordings could've been discarded. Hopefully, GET BACK will release some of the more worthwhile recordings in the BYG back catalogue. To hear an effective version of what this combination could sound like, 2 other recordings by this band, ("Black Gypsy" on Prestige records, and "Archie Shepp/Philly Joe Jones" on Fantasy, give a good indication of what a successful performance by this band sounded like. On both, the band is augmented by saxophonist Anthony Braxton and Violinist Leroy Jenkins), recorded Six Months later, and both are highly recommended, as are most of Shepp's European recordings from this era! Much of this material has gone out of print, so second hand record stores and exchanges should be checked to find them!